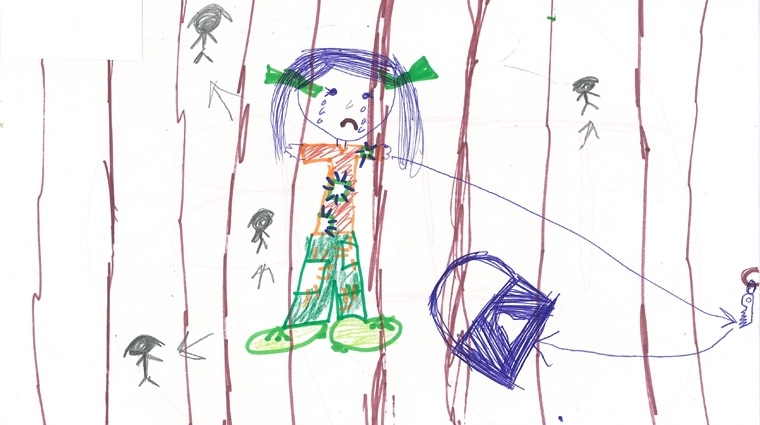 Drawing: Picture by a child in immigration detention. While our Federal Government is busy saying that the problem with the Human Rights Commission report “The Forgotten Children: National Inquiry into Children in Immigration Detention 2014” is its author, Gillian Triggs and they’re trying to find a way to get rid of her, they ignore the substance of her report. 233 assaults involving children and 33 incidents of reported sexual assault, with the majority involving children. It provides compelling first-hand evidence of the impact that prolonged immigration detention is having on their mental and physical health. The evidence given by the children and their families is fully supported by psychiatrists, paediatricians and academic research. The evidence shows that immigration detention is a dangerous place for children. Data from the Department of Immigration and Border Protection describes numerous incidents of assault, sexual assault and self-harm in detention environments. Just dwell on that, assault, sexual assault and self-harm. How is this OK? I’m sending a letter to my local member asking for an explanation and what actions the Government is taking to address these very serious matters.